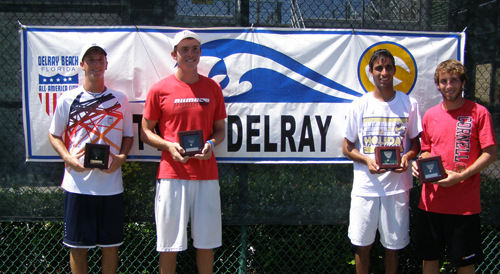 It was the final day of the USTA Boys' 16 & 18 National Clay Court Championships at the Delray Beach Tennis Center. The weather was the same as it had been and very typical for Florida, hot and humid with a threat of rain. The rain stayed away, though, as a talented group of 15-18 year olds picked up their trophies. The Boys' 16s were up first and No. 3 Noah Rubin (below) was on the court with No. 4 Luca Corinteli (above) for the final. The duo had been in this position before and the past wins were fairly easily divided among them so it could have gone either way. Both appeared worn out from the long week in the heat and humidity, but a few good points were played in the first set. Luca carried his break for 5-3 into a 6-4 set win and took an early break in the second set for a 6-2 victory. 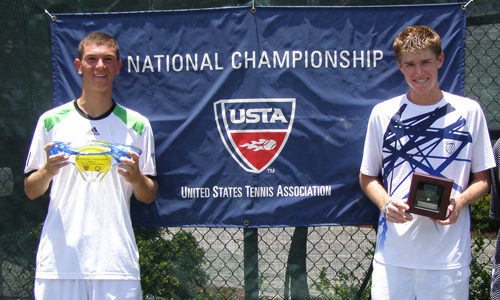 After the match, Luca was thrilled with his accomplishment and hoped to carry the momentum into Kalamazoo for the Nationals. Californian Alexios Halebian , however, is looking for any win he can get at Kalamazoo. The 17 year old, who recently turned professional, has never won a singles match at the prestigious junior event and hopes things will be different this year. In the meantime, he can enjoy the Gold Ball he won at the USTA Boys' 18 Clay Court Championships over Floridian Brett Clark . The match was filled with long games and even went into a tiebreaker in the first set. Alexios finished it with a score of 6-4 in the second. The boys' doubles match was probably the most exciting of the tournament. For three sets, Zach McCourt & Gordon Watson played Vikram Hundel & Alex Sidney (below). It was the way doubles should be, with quick hands, lots of volleys and good communications. It was one of those matches that you wish there didn't have to be a loser at, but gold and silver had to be given out and it was the No. 2 Zach & Gordon who prevailed over No. 8 Vikram & Sidney .Third Place in the doubles went to Stuart Kenyon & Ashok Narayana (9) over unseeded Andrew Adams & Christopher Cox . I finished up in time for a birthday celebration at a downtown Delray Beach restaurant I will definitely be back to. If you like Italian food, Triamonti is not to be missed!